Last time I described what I want to do. 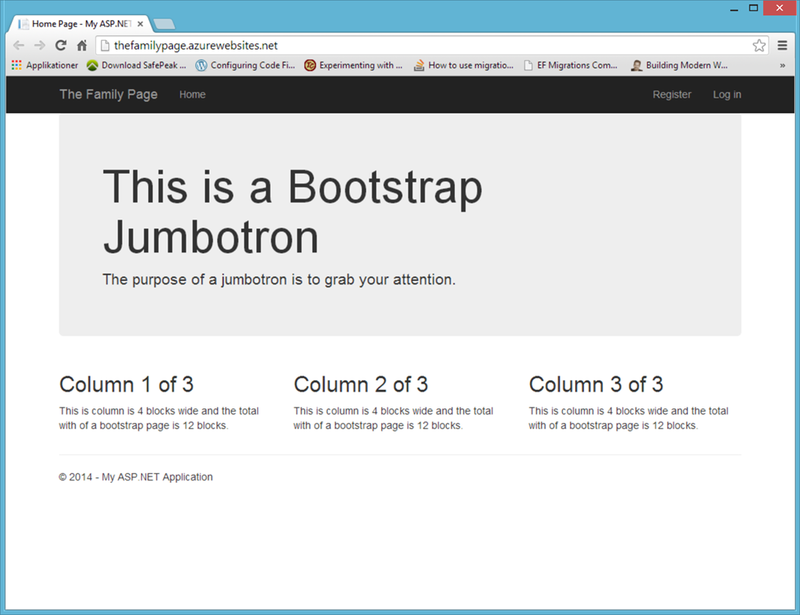 Create the basic web site from a template. Remove the parts of the template that I don’t want. So, this time will be pretty simple stuff, but the point of this is to take baby steps, and let every post in the series focus on a specific topic. 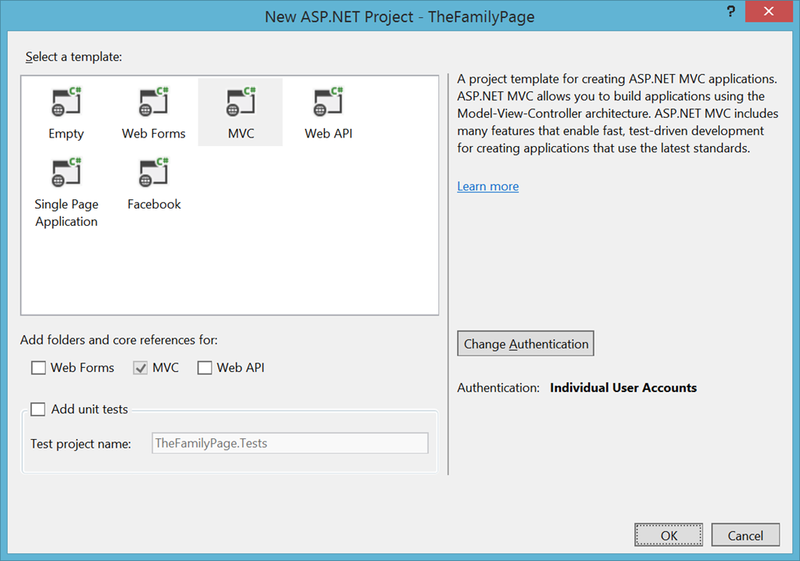 I give the project the name “TheFamilyPage” and I place it place it in a folder of my choice. For this project I have already created a GitHub repository, so I will be able to share the code. I choose the folder for my repository. This gives me different options for handling user accounts. I want my users to be able to login, and I am not running an intranet site or anything like that, so I keep the option for “Individual User Accounts”. This will create code to keep user account data in a database. The default is to use a database of type “LocalDb” which has the database in a simple file in the project. This is fine so we press OK and OK. Her I choose to “Update All” – this is the only time I recommend doing this. Normally I would only update the packages, that I need to update. This is because a lot of references in your code might get screwed up, so it is better to change on thing at a time. Next I go to the menu Tools –> Nuget Package Manager –> Package Manager Console. At this point I want to keep “Home”, “Register” and “Log in”. The about and contact pages are not need by this site. I also change “The Application” to “The Family Page”. In Views/Home/Index.cshtml I remove all the boilerplate text and put in my own placeholders. This is the basic site, that we are going to build on. Now we only have one thing left. 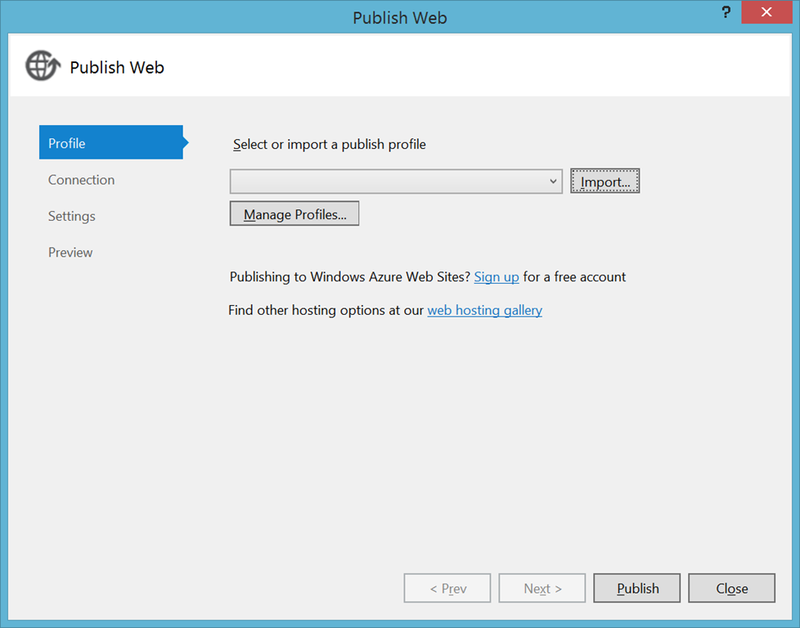 NOTE: This part requires you to have a Windows Azure account. If you don’t have one, you can get a trial by going to windowsazure.com. 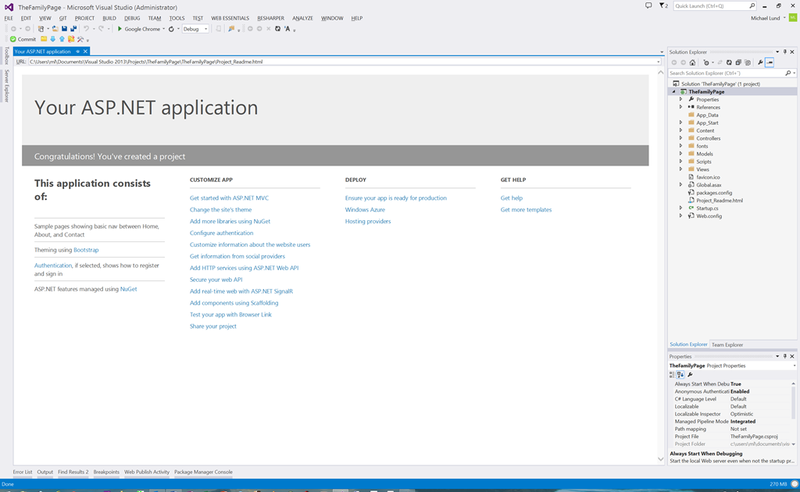 Right-click on the project in Solution Explorer and select Publish. If you are asked to log in to your Microsoft account then do so. Choose the connection string to use. We now have a totally bare bone web site published to Windows Azure, and we have installed and updated the frameworks we are going to use. 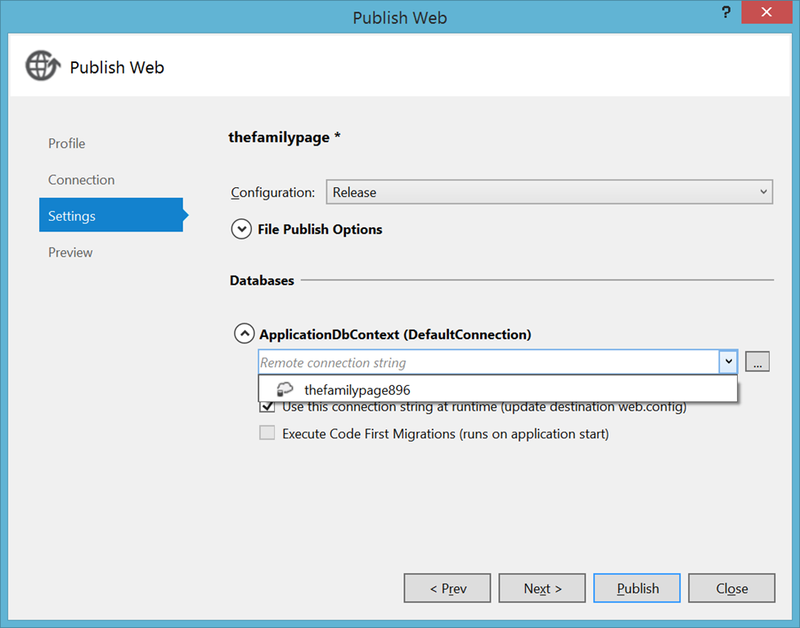 Next time we will look at the user accounts and we will start to use Entity Framework code first migrations. My current family site is used for the family members wish-lists and pictures, but it is based on a very old Umbraco version. This time I will try to create everything myself. Wish-lists for each family member. Every member of the family must be able to log in and update their wish-list. Pictures. It shall be possible to upload pictures (when logged in), and group them and show them by category. 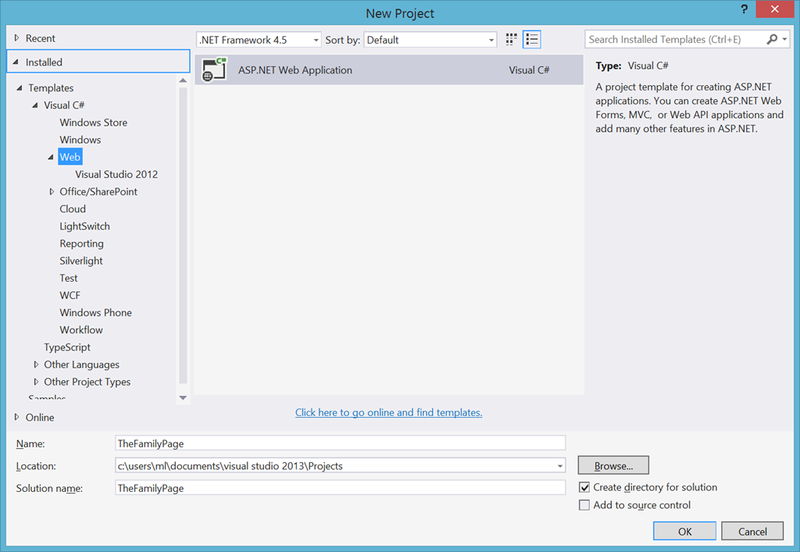 Entity Framework 6 – Code First. Pictures stored in Azure Blob Storage. This end the first part, which probably will be the only part without any code. In part 2 I will be creating the basic web site. The course it set, but I am open to input regarding features or possible use of tools. This is a book for manager and developers who wants the broad understanding of what NoSQL is and isn’t. As a developer that knows nothing about NoSQL, you will not be able to read this book and begin implementing a NoSQL solution. For the details of how to program against these databases you will have to look elsewhere (and the book never promises that you will be able to). You will however know and understand the different kinds of NoSQL databases and when to use which type. This is explained really good – Both with technical details and examplified with case studies. The first part is an introduction to NoSQL concepts and the benefits of NoSQL. This part is a bit annoying, because it is repeatetly said that NoSQL is better and scales bettder than relational databases, but I don’t feel the author gives an explanation as to why this is true – it feels a little like the author is preaching NoSQL, and at least there is no doubt he is a fan. This is rectified plenty in the later sections, so if you are like me, just push through, and you will get to the good stuff. The Second part is a walkthrough of the different kind of databases, bot the relational and NoSQL databases. This gives a good understanding of what each type does well and not so well. The third part is about NoSQL solutions with discussions about scaling, search and performance of different systems with references to real world solutions. The fourht and last part is about the use of functional programming and utilizing the parallelism of NoSQL systems, which typically have many thousand CPUs. This is a great book to get an overview of what NoSQL is and when to apply it. This blog post will focus on handling exceptions thrown by event delegates. //define car properties like color, weight, brand etc. But the user could supply any kind of filter he desired. So that was delegates – what is an events? And how is it different from a delegate? A C# event is collection of delegates that can be called by the event. So the event itself is not a delegate but you can add delegates to it using the += operator and remove them again using the –= operator. In the following example a timer is startet, and every second the timer calls the DoTick method. The DoTick method fires the Tick event if there are any subscribers. In our case there are two subscribers Tick and Tick2 – that will write to the console. This works fine – but in the t_Tick method I have hinted at a problem. What if one of the event handlers (subscribers) throws an exception? That is the topic of the next section. What happens if one of the event handlers throws an exception. As the code in DoTick is written now the application will be terminated – not so nice. If you are in complete control of your application you should have normal exception handling in each event handler, so execptions aren’t propagated back to the place where the event was fired from. What if I’m not in complete control of the application? 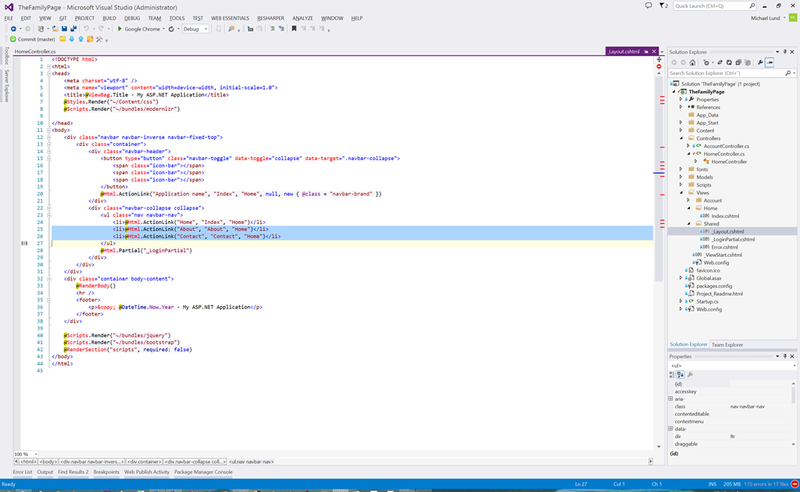 //do exception handling, log the error etc. Now our application doesn’t crash anymore, but what happens is that the event handlers are called one at a time, and then an event handler throws an exception, it is caught, but the rest of the event handlers will not be called, meaning that one defect event handler will ruin it for everybody else. Now only the defect event handler will fail and every body else will be able to do their job. I don’t want to write that ugly code every time I fire an event. 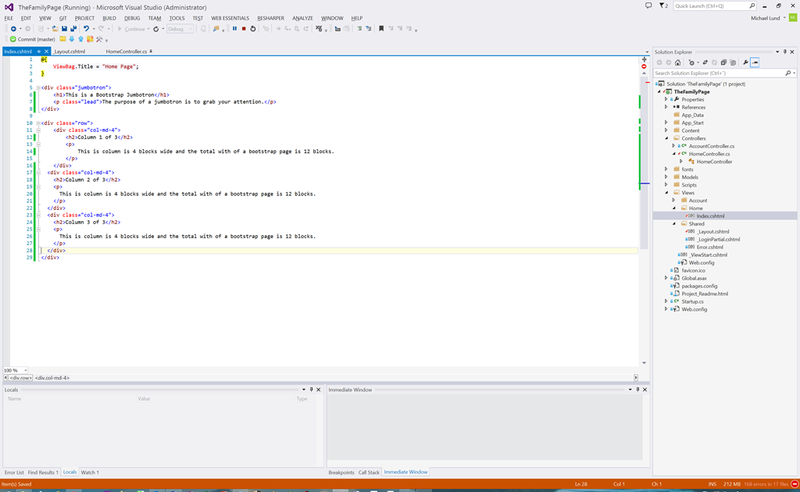 Yes the code is somewhat ugly and it is quite a lot to write just so we can fire an event. I already think that having to check for null is kind of stupid, since that is what you do every time – and this is event worse. Therefore I suggest to create an extensiuo method, that works for events that use the EventHandler signature. (which is what is generally recommende, so of corse you use that for all your event handlers). Yes it is – you should of corse still make sure that the error handling in the try-catch in the extension method do something appropriate like logging the error, disble the offending plug-in or whatever makes sense in your situation. One of the features of these sites, is that you get to listen to some of the work, these people have done before. This means we have a lot of mp3-files stored online at a web-hotel, and in the foreseeable future we will exceed the amount of space available. Therefore I have started to look at some alternatives – one of which is Windows Azure Storage. I had some problems however (the reason for this blog post). 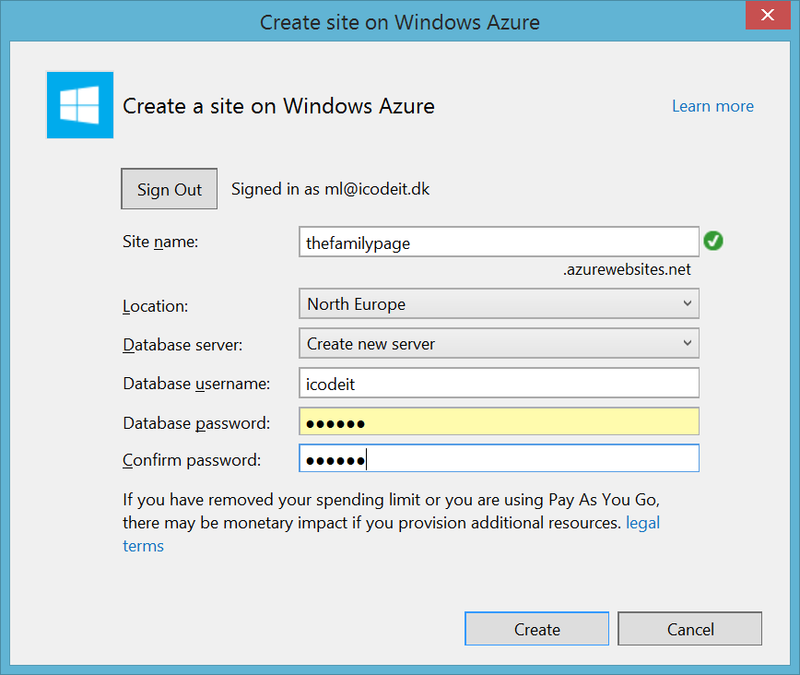 And I deviated from the guide in that I did not create a Windows Azure account – I simply used the built-in development test account, since I wanted to check out the programming model first. 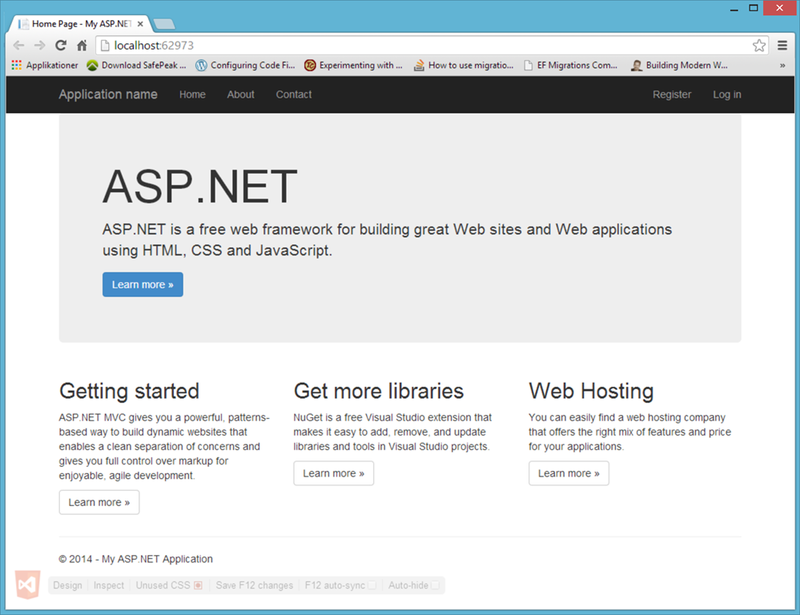 Also, you should note that in regard to The Guide mentioned above, I use .Net configuration, not Cloud Service. The Guide says that I can get the relevant assemblies with NuGet, so I didn’t bother to get the SDK. I could write some code and get it to compile without too much trouble. When I wanted to test it I ran into problems. I could not connect to the server. 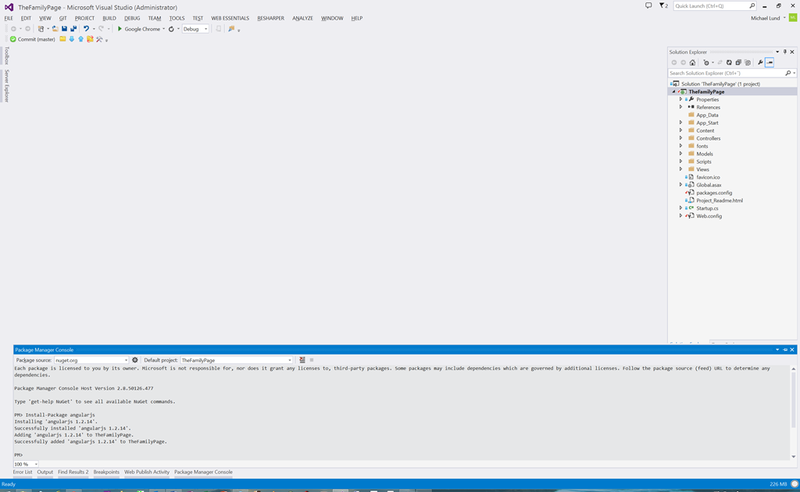 When you are using the development test account you are supposed to connect to a storage emulator – and you don’t get the emulator with NuGet. 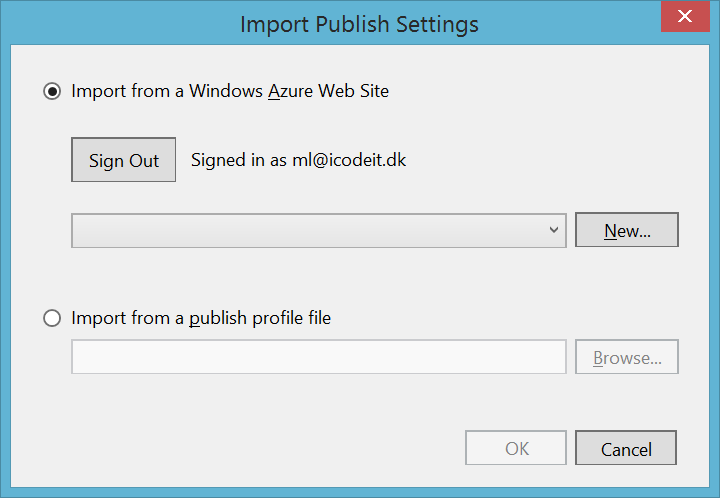 So I also downloaded and installed the Windows Azure SDK. Then I had the Storage Emulator – you have to start it yourself from the start menu. Restarting my program, I could now connect to the server. I immediately ran into the next problem. I received this error: “The remote server returned an error: (400) Bad Request”. It turns out that container names can only contain lowercase letters. So after changing “Media” to “media” it worked – I now have a container. The rest seems to be as described in The Guide – uploading, download, listing container contents and so on. The blob is simply data – like a file. The name of a blob can contain almost all characters, but should not end with . or / or a combination of these. 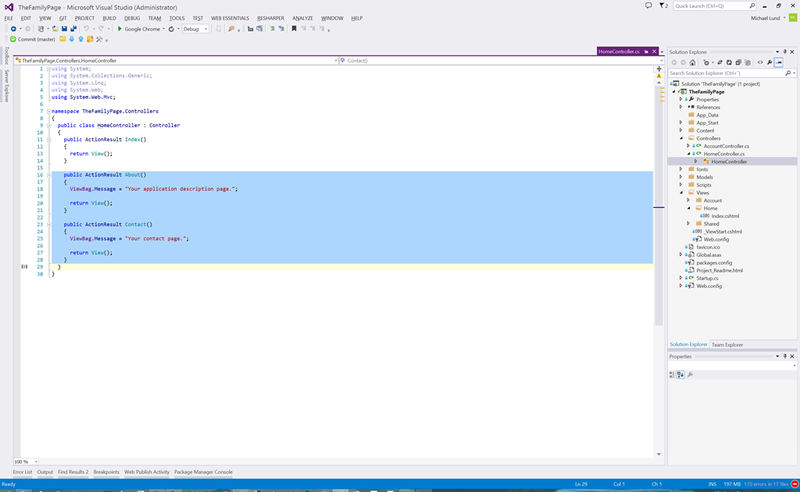 The URI for the file is created using the .Net URI class and this will strip off these characters. But in general / is allowed as part of the blobs name (the filename). This is because there is no directories in the containers data structure. 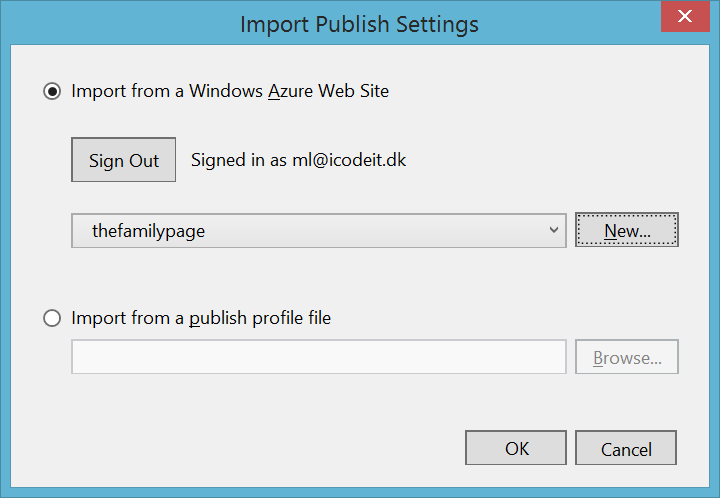 So the answer to one of my first questions: How do you create a directory in Azure Storage, is: You don’t. There is no such thing as a directory. But to create structure you can name your blobs like this “MySimulatedDir/MyBlob”. This section of The Guide http://www.windowsazure.com/en-us/develop/net/how-to-guides/blob-storage/#header-8 show how to list all the files in the container like they are in a directory structure, by using virtual folders. This is the second year in a row, I attended the DevReach conference. Last year I got an invite from Telerik, because I used some Telerik Silverlight components – this made me eligible for a discount. This year I simply joined the early bird programme. The early bird price was below 160 EUR for two days with 6 tracks including an amazing after party, where you could meet all the speakers and the other attendees that also chose to buy a VIP pass. The nearby five-star hotel was 80 EUR a night and the flight to Sofia is also quite affordable if you live in Europe. This year they also added a pre-conference day with four half-day workshop. Does these prices mean it is a discount conference? Granted: This is all very affordable, but I assure you there is nothing discount about this. It is a great conference with international speakers of a very high class. At the time of this writing the speaker list is still available at www.devreach.com. Topics covered include agile, testing, architecture, mobile developement, Windows 8 development, HTML5, cloud, web – also how to make cross-platform apps, with as much shared code as possible. I can only recommend that you follow @devreach on twitter or on Facebook, so you get notified when the registration for next years conference opens. And when it does, tell your friends! You will not regret it. Last week I was asked if the order of elements found using a where clause was guaranteed to be the same as the order of the original collection. That question is hard to answer. In the normal case (where nobody has overwritten any framework methods or any such thing) the answer in practise is yes, the order will be the same, because Where(), simply enumerates over the collection one element at a time, and if the elements parses the condition it is returned. This small test program demonstrates it – I have used a SortedDictionary, because it makes it easy to see the order. So we see the order of the original collection must be preserved. It should be noted, however, that nowhere in the documentation for Where() is it guaranteed to preserve the order. It is only stated that Where() will return an IEnumerable<T> containing the elements that satisfies the condition. This means it probably isn’t safe to rely on the ordering in the future. Further somebody might come by and try to make your foreach loop faster by adding an AsParallel() – and that will certainly ruin the order, so if order is important it might be better to add an OrderBy() – that will make it clear that order is important. (or insert a comment to the same effect).